In this book we have attempted to provide an overview of the state of knowledge of plants and the K-T boundary. The center of North America has yielded a rich floral record and the high quality and vast extent of exposures hold much promise for further refinement. Nearly all of the K-T boundary sections that contain evidence of the impact event are in North America. For this reason, it is difficult to make global generalizations other than to say that more sections are needed on other continents. In fact, it is fair to say that without the North American record, we would be hard pressed to argue for major floral change at the K-T boundary. Only the New Zealand sections document floral change relative to the iridium anomaly, and in those sections it is primarily the fern-spore spike that supports the concept of an impact as a causal mechanism. Were the New Zealand sections studied in isolation, it is questionable whether the fern-spore spike would have been recognized as significant. Only when taken in context of the North American fern-spore spike is the New Zealand occurrence interpretable. Nonetheless, its presence and close association with an iridium spike is one of the strongest arguments for the global reach of the immediate and deleterious effects of the bolide impact. The loss of forest canopy at the K-T boundary in New Zealand was followed by the nearly complete recovery of the pre-existing Cretaceous forest. This pattern, so different from the devastation seen in the North American localities, is also an argument for the attenuation of damage with increasing distance from the impact site. It is clear that a highly resolved stratigraphy is a prerequisite for even beginning to study the K-T boundary in terrestrial rocks. It is a tall order to request stratigraphic precision on the order of the impactite level of resolution, and it can be achieved only after basic geologic mapping has defined the appropriate units and placed them in an accurate temporal framework. Palynology is the only method that allows for both regional assessment and microstratigraphic resolution, and it is clear that this field is where future breakthroughs in locating new K-T boundary sections will take place. But palynology alone is not enough. It must be coupled with independent radiometric or magnetostratigraphic measures of geologic time. The study of the K-T boundary has raised the bar of stratigraphic resolution to almost impossibly high standards. Where once stages or subchrons were considered high resolution, the presence of the K-T impactite demands resolution on the order of a few millimeters, or a few years. Essentially all non-North American terrestrial K-T boundary sections are wanting when it comes to this resolution. Thus, it is premature to draw conclusions from these records. For this reason, our summary will focus primarily on the North American record and only refer to a few key points in other continents. For North America, palynology and megafloral paleobotany tell different parts of the same story. The palynology provides the regional spread of data and the high-precision correlation with the impact layer. Megafloral paleobotany is much more localized but does a better job of resolving patterns of climate, magnitude of extinction, plant-insect interactions, and plant-facies relationships. The abruptness of the K-T palynological extinctions is unprecedented and surprising in the fossil record. There is no other place in the terrestrial geological record where dramatic and regionally extensive floral change occurs over a stratum measured at the millimeter level. This high level of precision and resolution is coupled with an equally high level of extinction that is also regional to continental in its extent. Depending on your perspective, the fact that the best terrestrial K-T record is located on the same continent as the Chicxulub impact site may seem like an unlikely, perhaps suspicious coincidence. To us, it seems a lucky coincidence that the Chicxulub impactor hit a continent that was undergoing orogeny and subsidence. The resulting prevalence of Late Cretaceous and Paleogene Laramide foreland basins made ready receptacles for airborne debris. The odds of the rock record preserving a specific centimeter of sediment seems vanishingly small, and the repeated occurrence of this low probability event is a testimony to the rapid subsidence of the Laramide basins. Raton Basin and Pyramid Butte in North Dakota show clear evidence that the impact layer was deposited well after the formation of the "boundary lignite.'' In several sections north of Marmarth, North Dakota, the basal 2-3 m of the Fort Union Formation contains Cretaceous palynomorphs and at one locality, a Triceratops skull. Clearly the transition to mire-forming landscapes had come about in places before the Chicxulub impact occurred. In the central Great Plains, the initiation of mire formation seems linked to the transgression of the Cannonball Sea. This proximity to the K-T boundary is close enough that some authors have even gone as far as to suggest that marine regression caused the extinction of the dinosaurs (Archibald 1996). We feel that the marine regression hypothesis as an explanation for the dinosaur extinction was based on a very coarse reading of the stratigraphic record of the boundary. In other areas like Alberta and Colorado, where there is no evidence of an early Paleocene seaway, a lignite bed is often but not always associated with the impact bed, suggesting that there are other reasons for the initiation of mires at this time. The occurrence of the Fort Union zero (FU0) megaflora in the Fort Union strata of Cretaceous age in North Dakota provides possible insight about the ultimate floras of the Cretaceous. This megaflora is associated with a Cretaceous palynoflora but is represented by a depauperate leaf assemblage containing many of the species that become dominant in the Paleocene. When first discovered, it was quite confusing. It is now interpreted as a Cretaceous mire flora. 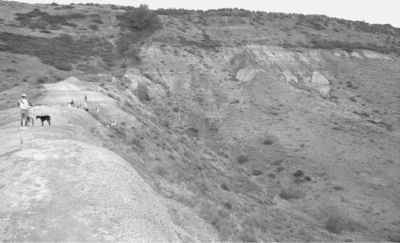 The discovery of this flora suggests that the Paleocene landscape was disproportionately populated by plants that had lived in Cretaceous swamps and that drier-ground Cretaceous taxa were the forms that suffered more extinction. This observation is similar to what is seen in the vertebrate communities at the K-T boundary where aquatic forms including turtles and crocodiles fared far better than did terrestrial forms such as dinosaurs and mammals. This hypothesis needs further testing because no FU0 megafloral assemblages have been discovered more than three meters below the K-T boundary. Another fascinating and subtle sedimentological feature of the K-T boundary transition is the apparent decrease in pedogenic alteration of fine-grained sediments above the boundary. This is clear in the central Great Plains where the well-rooted paleosols of the Hell Creek Formation give way to the variegated and laminated siltstone deposits of the Fort Union Formation. In the Denver Basin, a similar transition occurs within the Denver Formation at the K-T boundary. The result in both cases is that fossil leaves are more commonly preserved in the Paleocene portion of the section than they are in the Cretaceous portion. This is in part responsible for the historical over-collection of Paleocene fossils relative to Upper Cretaceous fossils. Casual observation of this pattern suggests that early Paleocene landscapes were relatively denuded in comparison to Late Cretaceous ones, but this explanation seems too facile and perhaps represents too literal a reading of the rock record. Certainly the high-resolution records afforded by palynology suggest that the duration of post-impact herbaceous vegetation represented by the fernspore spike was short lived, lasting only as long as it took to deposit the few centimeters of strata that represent the spike. The transition from heavily rooted Cretaceous strata to well-bedded Paleocene strata seems to have been much more long-lasting. Because stratigraphy is local, the fact that this pattern is present on a continental scale suggests that something more than local depositional conditions may have been responsible. In addition to the fernspore spike, the coal-petrographic record from the Wood Mountain core in Saskatchewan argues strongly for the devastation of the forest canopy immediately after the K-T boundary and its relatively rapid recovery within the time needed to accumulate ~50cm of lignite. What begins to become clear is a pattern of rapid deforestation at the K-T boundary followed by rapid reforestation by a depauperate group of swamp-loving trees. The distribution of fossil sites along an extensive latitudinal transect from New Mexico to Alberta provides the beginnings of a database where it will be possible to look at the latitudinal ranges of taxa before and after (in the case of survivors) the impact. Some initial observations on this topic are offered. One first-order observation is that plants producing Aquilapollenites were more speciose in the northern Plains and Canada than they were in the Raton Basin to the south. Because this group suffered nearly complete extinction at the K-T boundary, the percent of extinction decreased from north to south. This counters the expectation that extinction would be more extreme the closer the sample locality is to the Chicxulub crater. Perhaps this expectation is too simple. If the immediate effects of the asteroid impact included a blow-down of the standing forest followed by fire and then months of darkness and acid rain, we might expect that survivorship had more to do with ability to regenerate from rootstocks or seed banks rather than any advantage accrued by simple distance from the blast. We are just now beginning to have enough geographically distributed data to look at the differential response of specific taxa with latitude, and several patterns are beginning to emerge. One example is the lineage of plants that have improperly been attributed to the genus Artocarpus. "Artocarpus" lessigiana and related species were present in the last three million years ofthe Cretaceous and the first two million years ofthe Paleocene in the Denver and Raton basins, but only the last 500 000 years of the Cretaceous in the Williston Basin. Platanites marginatum and "Zyziphus" fibrillossus also share this pattern of occurrence. One possible explanation for this pattern is that certain species were limited by temperature and were able to extend their range to the north only under certain conditions. The cycad Nilssonia existed only in the last 500 000 years of the Cretaceous in the Williston Basin and is not present at all in the Denver and Raton basins. These patterns suggest that floral devastation was localized and that recovery was mediated by local climate. Plants that were marginal in a landscape might have been vulnerable to local extirpation by the impact event, and were not able to reestablish themselves in those areas because of the properties that made them marginal in the first place. It is not clear how many kinds of plant refugia existed, but certainly there must have been a variety. We have already suggested that mire plants seem to have survived better than dry-land plants in the Great Plains. It is also plausible that proximity to mountain ranges may have been beneficial due to the variety of habitats and potentially blast-sheltering topographies. In the case of the 1980 Mount St. Helens eruption and subsequent nueee ardente, topography was a significant factor in determining which trees were flattened and which remained standing. We have begun to pursue these questions in the Denver Basin by mapping Cretaceous and Paleocene floral occurrences relative to the margin of the Colorado Front Range to define vegetational trends relative to topography. Recent discoveries of Paleocene megafloras in the Middle Park Formation, which is located in the axial Middle Park Basin on the west side of the Front Range, have shown evidence for relative topography in the Rockies shortly after the K-T boundary. Prospecting in Cretaceous rocks in this area has the potential to define Cretaceous montane floras and perhaps to define K-T boundary refugia.